"LOS ANGELES ELECTRICIAN HERE TO TAKE CARE OF YOU, NOT TAKE ADVANTAGE OF YOU!" Electrician in Los Angeles serving the community. We are a Licensed, Bonded and Insured Los Angeles Electrical Contractor. Free Electrical Estimates, Company Lifetime Guarantee on Electrical work. Expert at house rewiring, electrical panel upgrade, electric vehicle charging station installation, generator installation, lighting retrofits for residential electrical and commercial electric projects! Call us about having an energy saving recessed lighting installation using LED light bulbs or T-8 fluorescent lamps. We have been in business since 1995. We at A Custom Electric, are a Los Angeles electric company, with electricians in Beverly Hills and electricians in Hollywood, who take pride in our workmanship because we have A Commitment To Excellence. We provide personalized electric service for each of our customers with first class electrical service at reasonable prices for all your residential electrical and commercial electric needs. We want to be your electrical contractor. Ask us for a free estimate on your electric upgrade or installation. That includes: house rewire, generator installation or electrical panel upgrade or electrical panel replacement, lighting design and lighting installation. 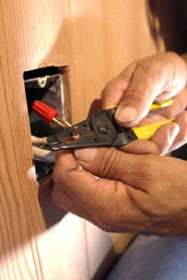 As an electrician in Los Angeles, many people know us electrical panel upgrade specialists and house rewiring experts! CUSTOM ELECTRICAL WORK A SPECIALTY! For A Free Estimate - Call us Today! Need an Electrical Contractor for Your House Rewire in Los Angeles? We are Los Angeles Electrical Contractors Who are Experts at House Rewiring | Home Rewiring! Generator installation. Generator installers and expertise in backup generator installation. 3. The quality of the work, in terms of installation and aesthetics. 4. Consideration of the customer's time and environment. A Good licensed Los Angeles electrician, will always puts safety first and has the knowledge and the experience to make sure that a good safe electrical job is what you get. The reason you hire a qualified, licensed electrician, is to make sure that your electrical projects are installed and your electrical problems are repaired, properly and safely. A Custom Electric is a community oriented Los Angeles electric company. We are considered a leading Electrical Contractor in the Los Angeles, California area, providing Beverly Hills electricians and Los Angeles electrician to the surrounding areas. We care about safety and quality while keeping the cost down of the work that an electrician from our electric company does for you. We are a full service Electric Company and offer both Electrical and Data solutions to the Residential, Commercial and light Industrial markets. Everyday we provide an electrician or electricians to help with the electrical systems of large and small customers alike. These customers include general contractors, home owners, renters, real estate agents, retail establishments, developers, architects, designers and production companies. We know that phone companies charge a lot of money to install a phone line and or a phone jack. We are one of the very few electrical contractors among Los Angeles electricians that has expertise in telecommunications wiring and data cabling ( computer network wiring ) and at prices that are almost always lower than your phone company or other companies providing data cabling or telecommunications wiring. Because we take pride in our work, we believe that if our electrician does a job right, unless a part fails, we won't have an electrician come back to fix it. And because of that belief, when A Custom Electric first opened as a licensed electrician in Los Angeles (as well as a licensed electrician in Beverly Hills), we were one of the first Electrical Contractors in Los Angeles (if not the first) to openly to offer a Lifetime Guarantee An All of Our Work for the life of our company. As a residential electrical contractor and Los Angeles electrician, we have the depth knowledge of the construction and electrical wiring of older homes needed to facilitate the installation and implementation of the new electrical technology needed to bring an older home current to meet the needs of modern day electrical requirements. We are called A Custom Electric, because we do custom electrical work and installations that when finished, look like they were always part of the original electrical wiring of the home. In this regard, we consider ourselves to be electrical craftsmen providing quality electrical work for you, the consumer. For new homes and remodels and service calls, an electrician from A Custom Electric strives at every stage of an electrical service call to all stages of electrical construction on a new home, room addition or remodel, to provide you with the highest level of personalized electrical service. As a commercial electrician, we operate no differently and are there when your business needs us. And we understand that many of the electrical problems of your business require immediate attention in order you to operate without interruption. An Los Angeles electrician from A Custom Electric has both the knowledge and the care to make sure that we can provide you with first class electrical service. We Are Here To Take Care Of You, Not Take Advantage Of You Whether you're a residential client in need of an electrician or a business in need of a commercial electrician, we treat you like a valued client and not as a dollar symbol! We have been in business for over 17 years and listed as both a Los Angeles Electrician and Beverly Hills Electrician and we have stayed in business by providing excellent electrical service to the surrounding communities. If your home or business is outside our area, make sure that you use a qualified, licensed Los Angeles electrician for all of your electrical needs. If you don't know of a good electrician, call us and we may know of a good licensed electrician that we can recommend to you. 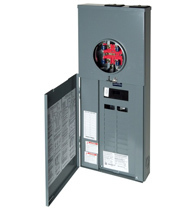 Need An Electrical Contractor For Your Electrical Panel Upgrade ? 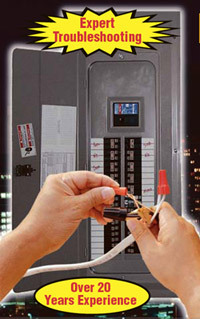 Among Los Angeles Electricians, Our Electricians are Electric Panel Upgrade Experts!